Figure 1 - Artist impression of the nearly polar orbit of WASP-79b. Image credit: Brett Addison (modified version of the WASP-8b retrograde orbit impression by ESO/L. Calçada). Figure 2 - Radial velocity data of WASP-79 during the transit showing the positive hump shaped velocity anomaly from the Rossiter-McLaughlin effect. Source: Addison et al. 2013.
i > icrit. Source: Figure 7.6 p. 244, Astrophysics of Planet Formation, Armitage, P. J., 2010. 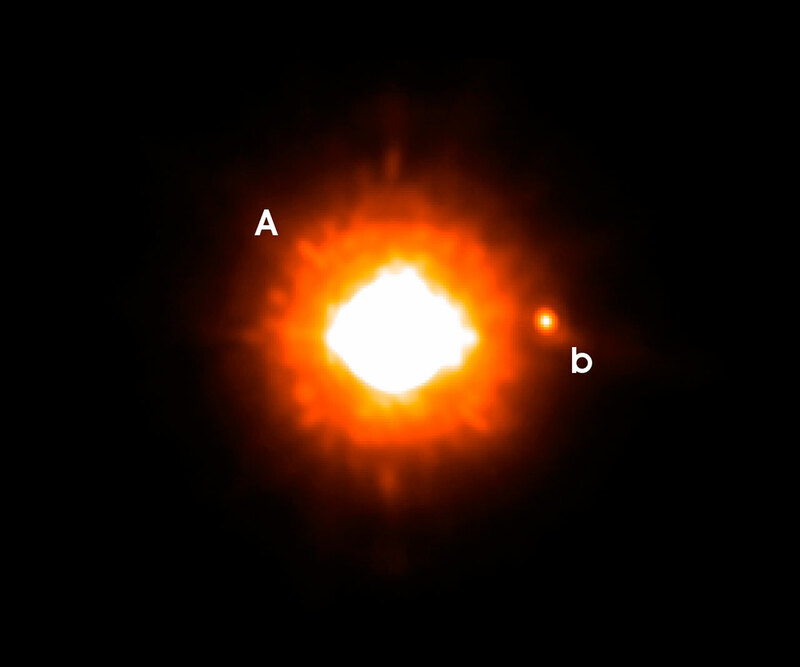 Figure 4 - Demonstration of the VLT NACO adaptive optics imaging in the Ks-band of the detection of a faint substellar or planetary companion. Searching for low mass stellar companions associated with planetary systems in spin-orbit misalignment could prove that the Kozai mechanism is what is driving planets into misaligned orbits. Image credit: ESO. 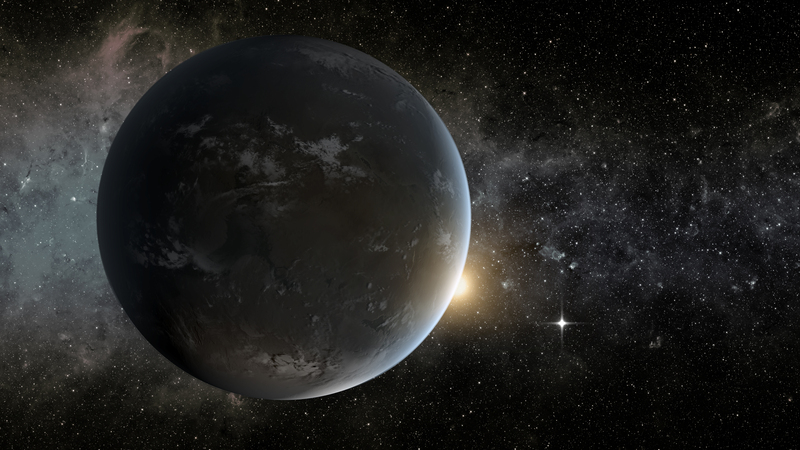 Figure 5 - Artist impression of Kepler-62e, potentially one of the most Earth like planets discovered so far. The detection and characterization of low mass planets is an area of research I'm very much interested in studying. Image credit: NASA Ames/JPL-Caltech. My research interest includes the detection and characterization of extrasolar planets. The motivation behind this research is to better understand the processes involved in the formation and migration of exoplanets. Before the discovery of the first exoplanets, it was predicted that Jupiter mass planets would be found in long period orbits of several AU from their host star and rocky terrestrial type planets would found much closer in, as observed in the Solar System. This assumption was based on the core-accretion model (see chapter 10.6) of planet formation that was developed, in part, based on a sample size of one planetary system (our own). It was quite a surprise to most astronomers when the first exoplanets that were discovered (eg. Peg 51b) were Jupiter mass planets in very short orbits of only a few days, known as hot Jupiters. This highlights the dangers of developing a model and drawing conclusions using a limited sample size. To explain these 'hot Jupiters', disk migration mechanisms were proposed as the most likely means to allow Jovian type planets to form several AU from their host star (as predicted from the core-accretion model) and then migrate in to much closer orbits after their initial formation. Disk migration seemed to nicely explain the observed population of hot Jupiters that were being discovered. However, this migration mechanism predicts that planets should retain their original alignment between the projected rotational angular momentum vector of their host star and the orbital plane of the planet (known as spin-orbit alignment) after migration. Since planets are expected to form from within the same disk of material forming the host star, the host star and the planet should be in spin-orbit alignment prior to the planet migrating inwards. This prediction can be directly tested through measuring the radial velocity anomaly produced from the Rossiter-McLaughlin effect when a planet is transiting across its star as viewed from Earth. 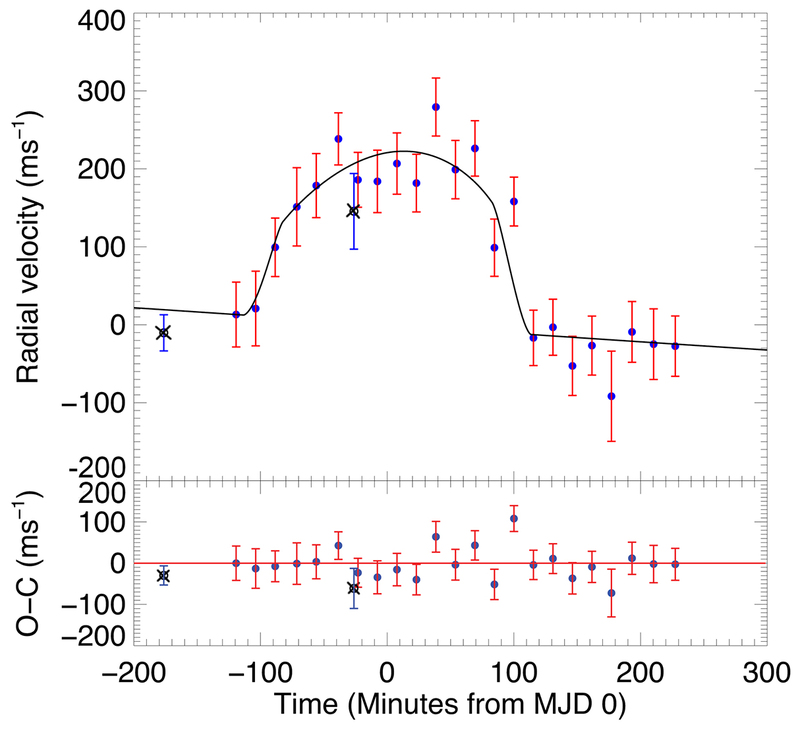 I recently measured the spin-orbit angle for the hot Jupiter system WASP-79b (Addison et al. 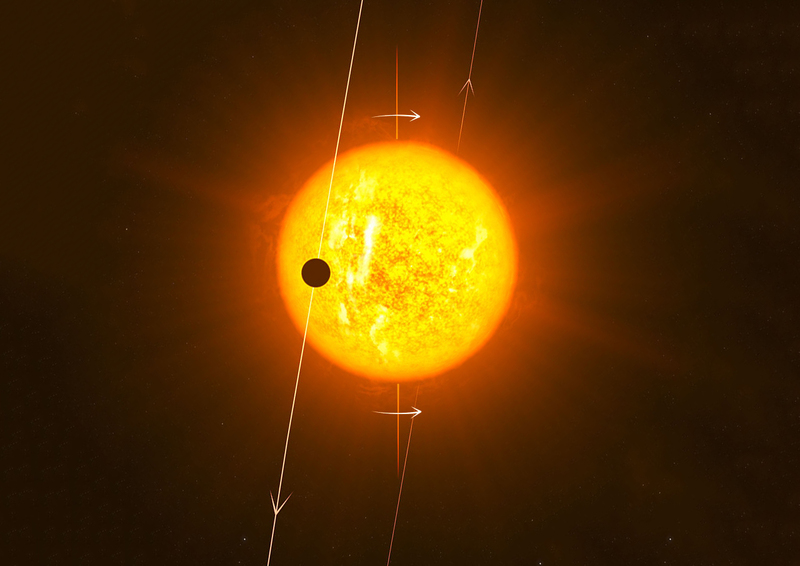 2013) and found the planet to be in a nearly polar orbit (Figure 1 shows an artist impression of the orbit and Figure 2 shows the radial velocity data taken during the transit event). In the last ten years, 74 planetary systems have had their spin-orbit alignments measured. Of these, 33 show substantial misalignments (>22.5 degrees), 10 of which are in nearly polar orbits and 7 are in retrograde orbits. If indeed disk migration is the primary mechanism driving planets into small orbital periods, then one would expect most if not all planets to be in spin-orbit alignment. This is simply not the case, thus the need to understand the physical mechanisms that are generating such high occurrence rates of spin-orbit misalignments. One commonly invoked mechanism thought to drive planets in spin-orbit misalignment is the Kozai mechanism. 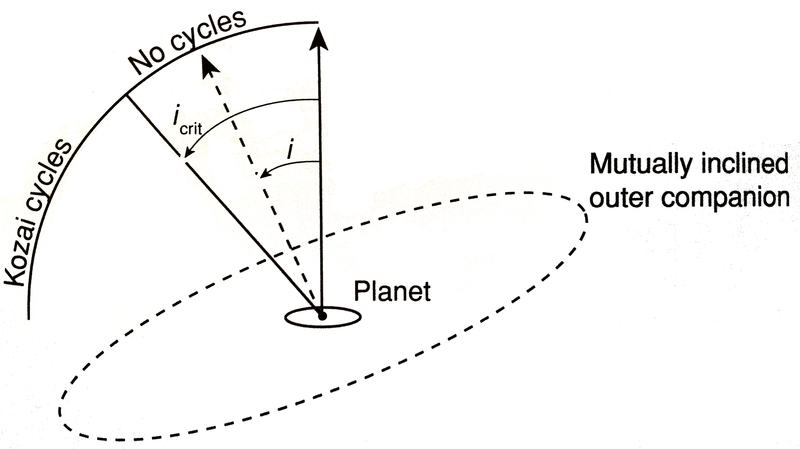 This mechanism involves a star-planet-star triple system in which orbital inclination and eccentricity are exchanged between the planet and outer stellar companion (see Figure 3). Naoz et al. 2012 finds that this mechanism can account for about 30% of the observed Hot Jupiter population and up to 100% of the misaligned systems. If indeed the Kozai mechanism were responsible for the large number of spin-orbit misaligned systems, one would expect to find stellar companions to these systems (such as shown in Figure 4). Greame Salter and I are proposing to use the adaptive optics system (MagAO) on the 6.5m Magellan Telescope in Chile to survey systems with spin-orbit measurements in order to search for the presence of stellar companions. Results from this research will either confirm or negate the presence of stellar companions around our sampled systems and test the hypothesis that the Kozai mechanism is responsible for producing hot Jupiters in spin-orbit misalignments. In conclusion, the research I'm conducting will hopefully shed some light on the mechanisms driving planets to migrate in tight orbits and have their orbits misaligned with the rotational axis of their host star. More work still needs to be done in measuring spin-orbit angles for newly discovered systems and testing the various migration mechanism (such as testing the Kozai mechanism by searching for stellar companions around system with spin-orbit measurements). Ground based transit surveys such as WASP (Wide Angle Search for Planets) and HATSouth and space based transit surveys such as the planned TESS (Transiting Exoplanet Search Satellite) mission will deliver suitable targets for such follow up work. My other areas of interest include the detection and characterization of low mass (terrestrial) planets near the habitable zone and transmission and emission spectroscopy to study atmosphers of transiting planets. The Kepler Space Telescope has been the most successful survey for finding planets to date. It has already discovered over 3500 transiting planet candidates, nearly 1000 of which are Earth or Super Earth size (RP < 1.25R♁ and 1.25R♁ ≤ RP ≤ 2.00R♁ respectively). Most of these planet candidates will turn out to be real thing though only relatively bright ones (V ≲ 12) will be followed up with radial velocity measurements for confirmation. Even more interesting are the ~36 or so Earth/super Earth mass objects orbiting in or near the habitable zone of their host star (for example Kepler-62e as shown in Figure 5). While determining the overall population and occurance rates of these planets is important, follow up characterization is needed to determine their bulk and atmospheric compositions as well as their formation and migration histories. In the future, obtaining atmospheric composition measurements through transmission and emission spectroscopy (as illustrated in Figure 6) using very high precision and stable spectrographs on large ground based telescopes (such as EXPRESSO on the VLT and CODEX on the E-ELT) and space based telescopes (such as the James Webb Telescope) could be sensitive enough to detect potential biomarkers and signs of life. Finding life on another planet is one of the ultimate goals in exoplanetary science and an area of research I'm very much interested in. Figure 6 - Illustration of a primary/transit (in front of star) and a secondary/occultation (behind star) eclipses of a planet. One can measure the atmospheric properties of extrasolar planets from taking a spectrum of the star during the primary and secondary eclipses known as transmission and emission spectroscopy. Image credit: Sara Seager.